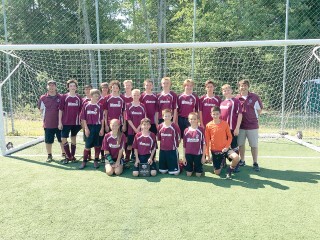 The Windham U14 Soccer team playing for the Windham Youth Soccer Association captured the championship in the Seacoast United tournament for Boys U14 2002/03 division over the Labor Day weekend. Players for the team are Alec Brooks, Baxter Chavonelle, Boden Sabasteanski, Cameron Joyce, Connor Cummings, Devon Harnden, Dustin Noonan, Dylan Gorman, Ethan Wert, Ezra Smith, Griffin Black, Hayden Bilodeau, Hunter Vail, Jacob Noonan, Julia McKenna, Keegan Brooks, Ryan Abbotoni, Sean Cunniffe, Simon Gabaree and Tyler Collins. The team is coached by Patrick Noonan, Peter Brooks and James Livengood. The team showcased good overall ball control, strong defense and goal tending and allowed 0 goals during the weekend and fended off a strong Seacoast United Manchester (NH) team for a 1-0 win in the championship game. Also earlier in the year, the team was complimented on its sportsmanship over a friendly game highlighted in a comment from coach Brownstein from South Portland. "I enjoyed the sportsmanship your team demonstrated. There was a play when one of my big guys landed on the deck and two of your players helped him to his feet while the ball was in play. Very cool." The team overall has 1 loss and is 6-1-2 overall.